Las Vegas Blog: Steve Friess' VEGAS HAPPENS HERE: The Crystals *IS* An Airplane Hangar Now! 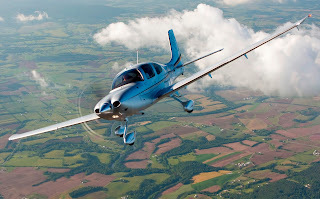 From January 6-8, Las Vegas will be treated to the first interior exhibit on The Strip of the Cirrus Aircraft SR22T. Taking center stage next to some of the best names in fashion, dining and nightlife, the SR22T will spread its wings and invite Crystals’ guests to climb aboard into the intimate setting of this luxurious plane. The turbo-charged SR22T will feature an interactive exhibit for guests. This hands-on display incorporates a special demo mode to allow interested persons to experience the SR22T in all its glory – climbing into the cockpit, trying out the controls, and exploring the advanced avionics and four-seat plush cabin – everything but take-off! Guests also can engage in the “Cirrus Perspective” glass cockpit, allowing them to simulate a real test-flight and experience operating the SR22T. Two large screens will invite guests to try out the plane’s flight controls and navigation system. Cirrus representatives will be on-hand January 6-8 from 11 a.m. to 11 p.m. each day to answer questions and guide guests through their personalized flight experience. It certainly sounds cool, I'll give them that. But is it enough to keep you from Cosmo? I know this is a bit off topic, but do you mind if I ask you a few questions regarding our food critics/Yelpers discussion? It's nice that the finer chefs emphasize presentation when it comes to desserts. They like to drizzle carmel or raspberry sauce over a fancy plate. It's always raspberries + dark chocolate concoctions. Don't they know they can use other fruits here as well? What is Tex-Mex? Does Tex-Mex mean that it's spicier than Mexican as they emphasize hot chillis? I think Mexican employs a simpler fair of beans & rice with an emphasis on lard as a staple? Tex-Mex is more like grilled fajitas in tequila? Thank you for your help, Steve! Help me be a better food connoisseur! PS: I know which one is the salad fork, because it's smaller. You work your way in from the silverware plates furthest away from the plate. Actually the cocktail fork goes first before the salad fork. Oh, I guess you gotta use cloth napkins instead of paper, too. Sounds like they are just a step away from kiosks and benches. I suppose it's a nice thing, but I'm not sure it's going to drive much sales traffic for them. They made the coldest, uninviting mall ever, filled it with high end retail and little to offer the casual tourist/shopper and then wonder why no one is interested in going in there. In my opinion there will have to be big changes at Crystals to make it solvent, much less profitable. Take a look at the safety record of Cirrus planes... It leaves a lot to be desired. I'd never ride in one. I don't know if you are aware of this Steve, but most of us gamblers will never enter City City. There is a death curse on that place from the workers who were killed.